I started out interested and sympathetic to Bukatman’s aims. He is a gifted writer who skillfully pulls apart and teases out the meaning of the 1950s texts. I had the impression that I was reading the “truest” version of the history of the typewriter that was available at the time Bukatman was writing. I was curious, though, about other histories of the typewriter that might have been published after this piece was written. After some research I was surprised to learn that there are quite a few histories of the typewriter, almost all of which were published well before Bukatman’s essay. See the Smithsonian’s bibliography of the typewriter and Google Books (related books links). A number of these were written by collectors or have illustrations targeted to collectors; but several are more serious, with Michael H. Adler’s The Writing Machine widely regarded as the most accurate. 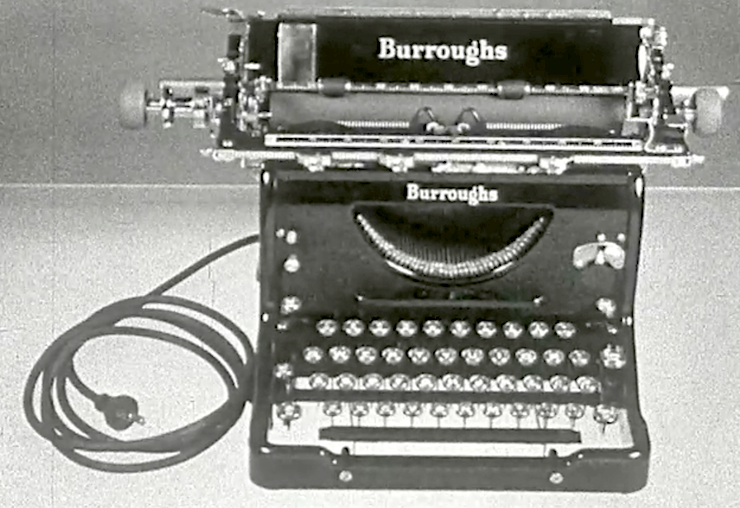 Despite Bukatman’s claim at the time of his writing that there weren’t academic books about the history of the typewriter, one of the two histories he cites, The Typewriter and the Men Who Made It, was written by a professor at Urbana, published by the University of Illinois Press, and reviewed in a journal of the Organization of American Historians. Another example from academia is George Nichols Engler’s dissertation, The Typewriter Industry: The Impact of a Significant Technological Revolution (1969). Am I simply being pedantic by pointing this out? I don’t think so. Bukatman, Professor of Art and Art History at Stanford, declares that his task is “reinstating history,” and the recitation of that history comprises about a third of the essay. Calling the lack of authoritative histories a “repression” and claiming an analogy to the “repression” of the anecdote about Gibson’s manual typewriter in cyberculture is central to the structure of his argument. And, through his fluent analysis of the texts he has chosen, he seems to present himself as an authority who has culled the best that is available. This entry was posted in Fall 2013 and tagged History, TypewriterHistory on October 16, 2013 by Eileen Clancy.